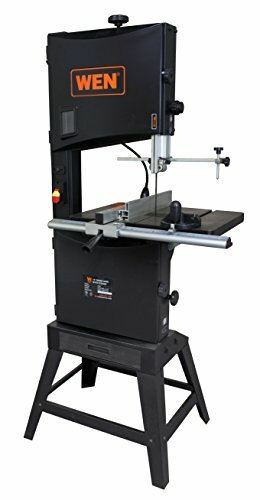 WEN 3966 Two-Speed Band Saw with Stand and Worklight, 14"
Remember when power tools were actually powerful? The WEN 14-Inch Two-Speed Band Saw is the perfect companion for any workshop. With a 9.5-amp motor and a 13-3/8 inch throat, this beast will attack boards up to 8.85 inches deep and 13-3/8 inches wide. Two-speed operation allows for speeds of either 1420 or 3280 FPM. The design of this saw uses 100-3/4 inch blades anywhere from 1/8 to 1 inches in size for a variety of both intricate and powerful cuts. The spacious work table measures in at 21-1/2 x 15-3/4 inches in size and can be swiveled up to 45 degrees. This package includes a flexible work light to illuminate the worktable, a 3-in-1 dust port to fit a variety of dust extractor hoses (1-3/4, 2-3/4, 4 inches), a sawdust collection drawer, a fence for creating perfectly straight cuts, and a miter gauge for angled cuts. The onboard circle cutting guide helps create perfect circles and curves up to 32 inches in diameter. The upper housing includes a small window to reveal a blade tension gauge. This gauge helps properly identify whether a blade has the correct tension given its particular width. The easy-to-assemble stand elevates the band saw without sacrificing space on the shop’s work bench. Ball bearings give the blade smooth operation and a long lasting life for years of dependable service. And because it’s a WEN product, your WEN 14-Inch Two-Speed Band Saw comes backed by a two-year warranty, a nationwide network of skilled service technicians and a friendly and helpful customer phone line all to make sure you remember WEN. Remember when you had a versatile and powerful woodworking saw? Remember WEN. View More In Industrial Power Tools.